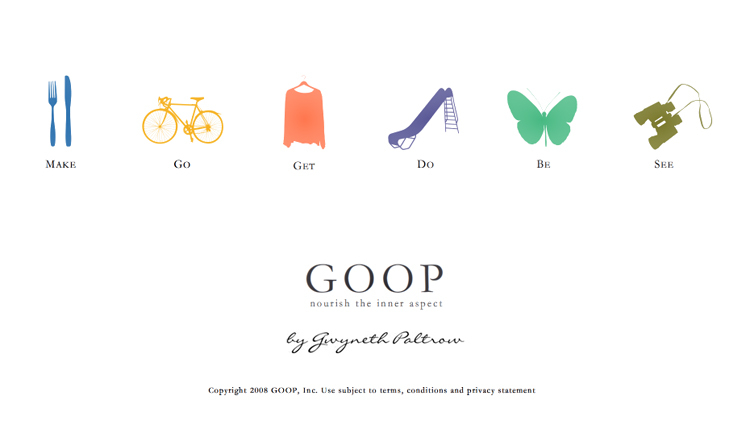 Gwyneth Paltrow has created a new lifestyle site called GOOP. Although there is no real content up yet, she explains that GOOP will be a “collection of experiences.” I like that expression. It’s what I’ve realized Somewhere in Middle America has always been–a collection of my experiences. I’ve written about being engaged, getting married, moving, finding new jobs, quitting those jobs and the people, places and things that have inspired me. I hope you’ve enjoyed reading about all of these things. I’m interested in konwing what specifically you’ve liked the most about my little blog. I have some big plans for it in the near future and am always interested in your input. I’m looking forward to GOOP’s official launch. I’m curious about Gwyneth’s life and the things she finds interesting, but as for the recipes she plans on sharing… Isn’t she on a macrobiotic diet? Yuck. And what do you think GOOP means? Perhaps it stands for “Gwyneth something-something Paltrow,” but my guess is that it’s just a made up word. 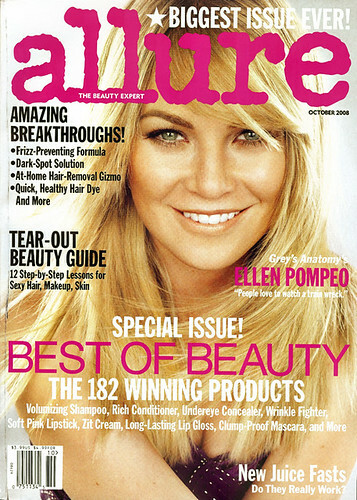 When I received the October issue of Allure magazine on Saturday, I was surprised to see Lindsay Lohan on the cover… until I realized it was Ellen Pompeo, as a blonde. I think that color really works for her. Do you? … or does Jessica Alba look strangely out of proportion in this Narciso Rodriguez gown at the 2008 ALMA Awards? Katie Holmes is kind of obsessed with French cuffing her baggy jeans, something I used to do with my Z. Cavaricci’s in the early 90s. Just because NKOTB is on the radio again doesn’t mean we need to dress like it’s 1991. C’mon. Would you rock the cuff again? I’m sure others have, but I’ve never really noticed that SJP has REALLY old hands. Like, grandma-old. I guess that’s why anti-aging hand creams like RoC Retinol Correction Hand Repair are all the rage now. Very very uncomfortable. They look so disconnected and like they hate each other as much as the tabloids suggest. Would anyone be surprised if this picture turned out to be four separate images photoshopped together? Very ladies who lunch…on the blood of virgins and sacrificed lambs. They all have crazy eye! Read the rest of her article for her thoughts on each of the women. This photo scares the crap out of me. That pony is terrifying. So is Elisabeth Hasselbeck’s outfit.